Today we have searched and want to share to you all who love knitting with this beautiful and cozy knit garter stitch Miss Marple scarf. A scarf that stays perfect around your neck by using the keyhole. 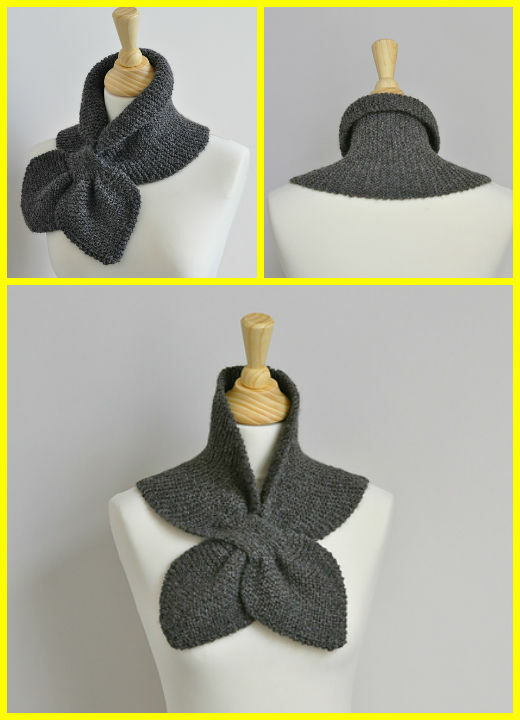 The middle section of the scarf is wider so your shoulders can stay warm too and you can also create a little collar. You can wear the scarf in many different ways, just the way you like it. And over your cloths of under your coat. We know that women love to look elegant and pretty in every situation, even when they are going on shopping near their house.If we want to look wonderful and beautiful we need pretty clothing and accessories like scarf, gloves and etc. But in winter it’s not enough to look pretty we also need to wear warm to feel safe in frosty weather, so we have searched for you pattern for very elegant and useful accessories. This elegant and creative scarf will look perfect at many type of clothing and you can change the color if you are thinking that other colored scarf will look better at the clothing from your wardrobe. Easy knit, mostly in garter stitch and little piece ribbing. Start now and make a gift for yourself. In this pattern author has explained everything step by step, so thank for that, because we will have no problems at time of knitting. Happy Knitting.